One of the newer communities in Algiers, Aurora Riverside offers the safety and security of a gated subdivision and the exclusivity of a small community (only 41 home sites!) combined with a convenient location just off of General Meyer Avenue and backing up to the Mississippi River. With architectural designs reminiscent of old New Orleans, homes in Aurora Riverside have a historic feel while offering all of the modern amenities you would expect from a 21st century community, including an active home owners association that is dedicated to preserving the surroundings and lifestyle the residents have come to expect. 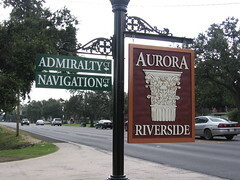 With so few home sites, turnover in Aurora Riverside is low and lots facing or backing to the river command a premium. Annual HOA dues are currently $500 per property. All construction plans must be approved by the Architectural Review Committee, with a minimum living space of 2,400 square feet in single story homes and 2.600 square feet in two story homes. For more information about buying or building in Aurora Riverside, call us at 504-327-5303.